Once we found out we would be going to New York City, New York to photograph Leyla and Mike's engagement session, Neal's ideas were already flowing. He had one building in mind that he had to shoot at. 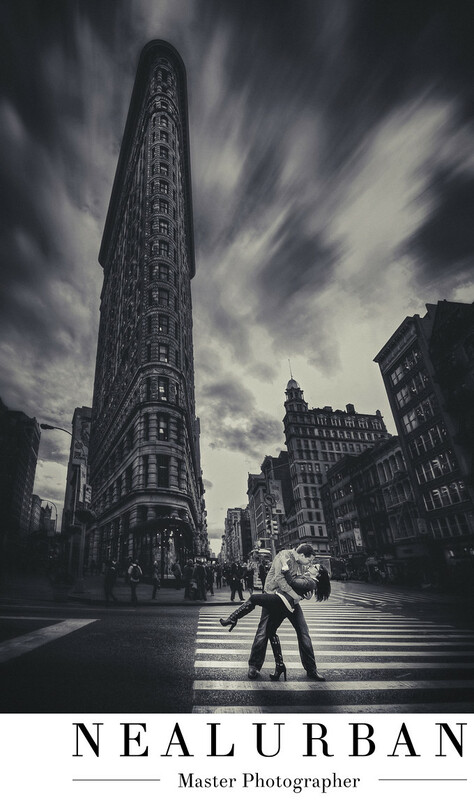 He wanted to use the Flat Iron Building for photos! Leyla and Mike had a few destinations they wanted to go to for photos. They wanted Central Park (where Mike proposed), Tiffany on Fifth Ave, Waldorf Astoria, and Time Square. We decided we needed at least two days to do all of this. Then if there was time, Neal wanted Flat Iron. They really liked this idea. This image was literally before we had to hail a cab and catch our flight home to Buffalo. This is one of the busiest intersections in the City. Neal picks this one for Leyla and Mike to be in the street. Before they went into the street, Neal told the couple what he wanted. He wanted a dip! But right in the middle of the road. We watched the traffic lights and timed out how much time they would have before traffic started again. Once we figured that out, we realized people would be crossing the street as well. We had to go with it. Leyla and Mike did a lot of running back and forth for this image. People started hanging back to watch. Finally we caught our break and there was a small opening! It was awesome! Neal knew right away this image was going to be black and white. Color did not do this image justice. You could not really see any details. We still look back at this image and can't believe we put Leyla and Mike in a NYC street. We would do it all over again if we had to! Location: 175 5th Ave, New York, NY 10010.